Montana is a geological paradise. Within its borders you will find geologic wonders that span the entirety of geologic time. Precambrian rocks exposed in SW Montana contain some of the oldest rocks on the North American continent, dating back to 3.6 billion years. The high mountain ranges of western Montana have been uplifted by titanic tectonic forces, and this landscape yields to the expansive Great Plains of eastern Montana. Some of the world's most famous fossil localities were deposited in the Cretaceous interior seaway and have been investigated at Egg Mountain and the Hell Creek Formation. The landscapes have been sculpted by Alpine and continental glaciation, and through the great river systems of the Yellowstone, Missouri, and Columbia River basins. The state motto, "Oro y Plata" (Spanish for gold and silver) reflects the impacts that mineral extraction has had on the economy of the state from the Virginia City gold rush through the discovery and extraction of copper at Butte (the "Richest Hill on Earth") and the only platinum/palladium mine in the United States at the Stillwater Mine; but, don't forget about the extraction of the beautiful cornflower-blue Yogo sapphires and industrial minerals such as talc, and oil and gas production in the Williston Basin and Bakken Formation in eastern Montana. The wonders of this natural legacy extend from horizon to horizon under the Big Sky. 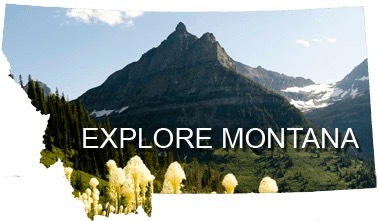 This is an invitation for you to explore the natural treasures of the Treasure State of Montana. "Geoheritage" is a generic but descriptive term applied to sites or areas of geologic features with significant scientific, educational, cultural, or aesthetic value. Scientifically and educationally significant geoheritage sites include those with textbook geologic features and landscapes, distinctive rock or mineral types, unique or unusual fossils, or other geologic characteristics that are significant to education and research. Culturally significant geoheritage sites are places where geologic features or landscapes played a role in cultural or historical events. Aesthetically significant geoheritage sites include landscapes that are visually appealing because of their geologic features or processes. Many geoheritage sites can be tourist destinations and provide local and regional economic benefits. 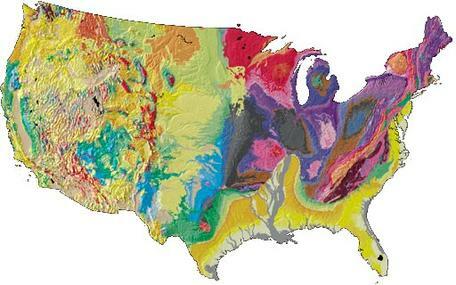 "(Geological Society of America; GSA Position Statement on Geoheritage). The National Park Service defines America's Geoheritage as: "Geologic heritage encompasses the significant geologic features, landforms, and landscapes characteristic of our Nation which are preserved for the full range of values that society places on them, including scientific, aesthetic, cultural, ecosystem, educational, recreational, tourism, and other values. Geoheritage sites are conserved so that their lessons and beauty will remain as a legacy for future generations." One-of-a-kind natural features, entire landscapes, outcrops, rock, mineral or fossil locations that need to be preserved for exploration and discovery by future generations. Direct observation of natural phenomena provides important insights about the operation of the Earth system... "The field is where the truth resides; it is the essential core of geology. Models are essential figments of the imagination which must be tested by observation. Those who do no field work and do not gather data will never understand geology (John Dewey, in Butler, 2008)." Some locations are linked to the development and evolution of the geosciences as a discipline (e.g., location of type sections of rock formations, outcrops that provide the "smoking gun" of evidence for geologic processes such as the K-T Boundary). Geoheritage sites may mark locations of human interactions with nature--such as locations of resource development (minerals, energy, soil, water), or as humanity impacts or is impacted by natural hazards. Land owners, land managers, and government agencies may not be aware of the rich natural and cultural resources that are present. See the article, Classic Geologic Outcrops: Preservation and Future Accessibility–Marjorie Chan and Diane Kamola, GSA Today, vol 27 # 11, November 2017, as an indication of the importance of preservation of classic geologic outcrops to the future of the geosciences and geoscience education. Education--More people in the United States choose to visit natural parks, museums, aquariums and science centers than attend professional sporting events (attributed to NSF; see Center for Advancing Informal Science Education)! Annually, millions of people visit National Parks and Monuments managed by the National Park System (see Annual Visitation Highlights). The American Alliance of Museums Museum Facts reports: "There are approximately 850 million visits each year to American museums, more than the attendance for all major league sporting events and theme parks combined (483 million in 2011)." These "free choice" learners actively seek out experiential learning that makes connections to their personal lives and that also supports life-long learning. "Informal science education" is voluntary, self-directed, and lifelong. It is learning that provides an experiential base and motivation for further activity and learning. NSF's Informal Science Education (ISE) program supports projects in which "learning is... motivated mainly by intrinsic interests, curiosity, exploration, manipulation, fantasy, task completion, and social interaction. This informal learning can be linear or nonlinear and often is self-paced and visual- or object-oriented" (National Science Foundation, 1997, p. 8, NSF #97-20). In the geosciences, it is the tradition of geologists to take field trips to these iconic sites; the dictum "He who sees the most rocks makes the best geologist" (H.H. Read, 1940) holds true today. K-12 class field trips, collegiate course and field camp trips, professional society field trips all rely on access to these special places for continuing geoscience education. Field instruction is fundamental to geoscience education. (See Mogk and Goodwin, 2012, Learning in the field: Synthesis of research on thinking and learning in the Geosciences, Geological Society of America Special Papers 2012;486;131-163 (volume can be purchased at the GSA Bookstore). There is a real need to identify, characterize, and make accessible geoheritage sites of national to local interest, to attract, inspire and support the success of future natural scientists; to support the continuing education of professional geoscientists in formal and informal instruction; and to inspire a sense of awe and wonder about Earth and its systems for the general public. Sustainable Economic Development--Geotourism can be a major economic driver. The Outdoor Industry Association reports that outdoor recreation economy generates $887 BILLION in consumer spending annually, 7.6 million American jobs, $65.3 billion in federal taxes, and $59.2 billion in state and local taxes. Geoheritage sites can serve as a portal to engage the public and encourage them to visit (by design or serendipitously) the natural wonders around us! 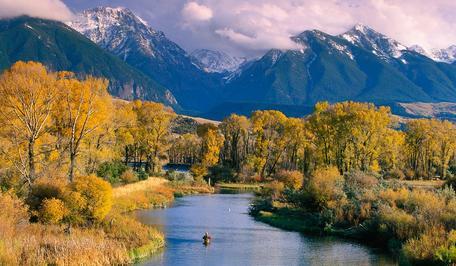 The Get Lost in Montana! campaign, sponsored by the Montana Department of Commerce is one example of how to promote geotourism. The Global Geopark Network is an international program sponsored by UNESCO. "Global Geoparks are single, unified geographical areas where sites and landscapes of international geological significance are managed with a holistic concept of protection, education and sustainable development. A UNESCO Global Geopark uses its geological heritage, in connection with all other aspects of the area's natural and cultural heritage, to enhance awareness and understanding of key issues facing society in the context of the dynamic planet we all live on, mitigating the effects of climate change and reducing the impact of natural disasters." As of April 2018, there are now 140 UNESCO Global Geoparks in 38 Member States that are currently members of the Global Geoparks Network. Learn more about UNESCO Global Geoparks (2016). The Montana Geoheritage Project is being developed to follow the philosophy and guidelines of the Statutes of the International Geoscience and Geoparks Programme, a co-operative venture with the International Union of Geological Sciences (IUGS), and the UNESCO Global Geoparks. The National Park Service has primary responsibility for maintaining an inventory of America's Geoheritage. The NPS sponsors the National Natural Landmarks Program that "...recognizes and encourages the conservation of sites that contain outstanding biological and geological resources. Sites are designated by the Secretary of the Interior for their condition, illustrative character, rarity, diversity, and value to science and education. The National Park Service administers the program and works cooperatively with landowners, managers and partners to promote conservation and appreciation of our nation's natural heritage." They also support this inventory of Geoheritage Sites--Examples on Public Lands, Natural Landmarks, Heritage Areas, and the National Register of Historic Places and a state-by-state Unofficial National Register of Geoheritage Sites. 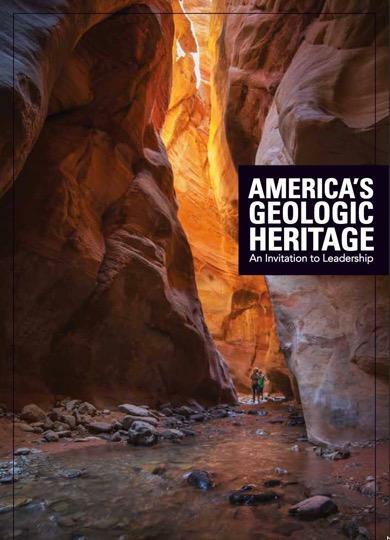 The National Park Service in collaboration with the American Geosciences Institute has published the booklet America's Geologic Heritage an Invitation to Leadership. "America's geologic heritage arises from the features, landforms, and landscapes characteristic of the United States, which are conserved in consideration of the full range of values that society places on them,so that their lessons and beauty will remain as a legacy for future generations". America's geologic heritage engages many communities, and your involvement will ensure its conservation for future generations. Every state in America has a state geological survey, and these agencies variably provide links to sites of great geologic interest in each state. See the Association of American State Geologists (AASG) for links to the geological surveys in each state. The National Academy Press has published a report on America's Geologic Heritage–Invitational Workshop sponsored by the American Geosciences Institute (AGI), the Geological Society of America (GSA), the U.S. Geological Survey (USGS), the National Park Service (NPS), and the Colorado Geological Survey (CGS). The National Academy of Science/National Research Council sponsors the U.S. Advisory Group is exploring topics of Geoheritage in the United States and its intersections with Global Geoparks. The Geological Society of America has developed the GSA Position Statement on Geoheritage that affirms the importance of conserving geoheritage sites in support of the geosciences. How does the Keweenaw window into Earth's history contribute to our world view?" US Geopark Heritage: Rivers, Rail, Karst, Coal and People at the Appalachian Geopark of West Virginia--Burns et al., 2017, GSA Annual Meeting abstract 93-6, Seattle, WA. The Appalachian Geopark Aspiring Project, West Virginia, USA: Rivers Rail, Caves, Coal and People --Burns et al., 2017, European Geoparks 14th Conference. MT Geoheritage Sites module--use this website as a guide to plan your next vacation to the Augusta-Choteau area of the Rocky Mountain Front in Montana. This website provides an introduction to the geographic setting, bedrock geology (stratigraphy and structural geology), paleontology (famous fossil site at Egg Mountain, but also including invertebrate and mammalian paleontology, surficial geology (glaciated landscapes, river systems), climate and climate change, agriculture, topical issues (e.g., energy exploration, wilderness areas), and cultural heritage (the writings of Ivan Doig connected to this landscape; heritage of the Tribal Nations who traditionally inhabited this area). MT Road Logs module: we've selected ~50 of our favorite road logs that are used as guides to explore a variety of geologic features; these road logs are typically used by professional geologists on field trips, as guides to geologic course field trips and field camps, but they are also accessible to the interested public. MT Trail Guides module--We developed step-by-step guides to popular hiking trails in the Bozeman area. Plan to take a day hike to; 1) Sacagawea Peak and walk through layers of sedimentary rocks that include diverse invertebrate fossils (algal mounds, corals, brachiopods and more), geologic structures that formed through Laramide and Sevier style deformation, and glacially sculpted landscapes that continue to evolve through modern surficial processes; 2) Hyalite Peak, where you will walk through volcanic deposits very similar to modern day Mount St. Helens eruption; and 3) Bear Basin near Big Sky, where you will cross the range boundary Spanish Peaks fault into the deep crustal rocks (from depths as much as 30 km/20 miles!) and that are among the oldest rocks on the North American continent dating back to 3.5 billion years!